Dirofilaria immitis, the causative agent of canine heartworm disease, induces significant cardiopulmonary pathology in dogs in the United States and worldwide. Increased movement of domestic dogs across the U.S. While dogs are considered to be definitive hosts for heartworms, D immitis may infect many different species, including indigenous canids, such as wolves, foxes, and coyotes; many species of felids; and occasional incidental hosts, such as deer, ferrets, raccoons, horses, and primates. 1. 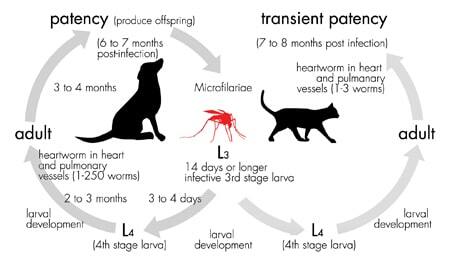 The life cycle of a patent CHW infection starts with introduction of L3 larvae from an infected mosquito into the canid host. 2. In the dog, the larvae mature into L4 larvae and then into adult worms that localize in the pulmonary arteries and occasionally in the right cardiac ventricle. 3. Following a prepatent period of 6 to 7 months, microfilariae are produced via sexual reproduction and are released into the dog’s bloodstream, where they may remain viable for months to years. 4. Mosquitoes feeding on the infected host ingest the microfilaria, which then migrate to the Malpighian tubules where they mature into first-stage larvae. 5. Ultimately, the larvae mature to the L3 stage in the salivary glands of the mosquito and become infective, thus completing the heartworm life cycle. Periodic testing, usually yearly, is recommended for all dogs, and it is advisable to retest whenever changing chemoprophylaxis agents or starting prophylaxis after a period of noncompliance. When changing heartworm preventive medication, additional testing 4 months after switching products is required to evaluate the efficacy of the original product. This process is especially important in light of recent suspicions of growing CHW resistance to macrocyclic lactones in some regions of the U.S. (see Prophylaxis Update). Begin CHW prophylaxis in puppies as early as possible, usually before 8 weeks of age. Year-round chemoprophylaxis (even in areas where cold weather interrupts the CHW life cycle) is highly recommended to increase compliance. Although collies and some other dogs are sensitive to macrocyclic lactones, commercially available products for dogs used at the recommended doses are considered to be safe in all breeds. Reports of lack of efficacy of macrocyclic lactones in some areas of the U.S. are being investigated; currently, there is no strong evidence of widespread emergence of resistant strains of CHW. Lack of treatment and lack of compliance are of much greater concern. The issue of apparent lack of efficacy is yet to be resolved. A recent re- port detailed genetic changes in some populations of heartworms that may confer greater resistance to chemoprophylactic agents.5 Whether or not these changes translate to the emergence of macrocyclic lactone-resistant strains of heartworms in endemic populations remains to be seen. Microfilaria may be visualized in whole blood using a direct smear technique or from blood concentrated using a modified Knott’s test or membrane filtration. Compared to other methods of heartworm detection, blood smears and concentration techniques are relatively insensitive; therefore, a test should not be considered negative until at least 1 mL of blood has been examined.4 However, the sensitivity of the modified Knott’s test is greater than that of the direct smear method when samples contain < 50 microfilaria per 1 mL of whole blood6 and the test provides enhanced ability to distinguish D immitis from other canine microfilaria. Identify dogs at risk for severe reaction to treatment with microfilaricides. Enzyme-linked immunosorbent assay (ELISA) technology (Figure 1) was used in the first in-clinic CHW antigen tests; however, several current in-clinic CHW antigen tests are immunochromatographic (ICT) assays (Figure 2). 1. Anti-CHW antibodies (Ab) linked to an enzyme are mixed with whole blood, plasma, or serum, allowing them to bind to heartworm antigens (Ag) in the test sample. 2. 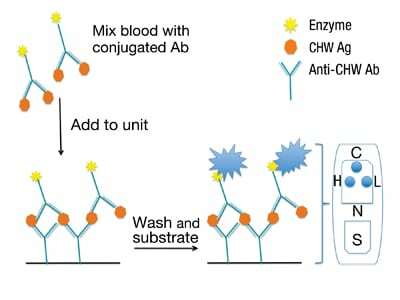 The conjugate–sample mixture is then applied to the sample port (S) and allowed to flow across a membrane on which spots of additional anti-CHW Abs have been bound to detect low (L) and high (H) antigen levels. 3. A wash solution is used to remove unbound enzyme conjugates. The wash is followed by a substrate solution that acts with the bound enzyme to produce a color change, indicating a positive test. 4. Positive (C) and negative (N) control dots are also included on the membrane. Presence of a color change in the positive control is required for a valid test, and sample dots must also have stronger color development than negative control. 5. When no positive control dot develops or the negative control has high reactivity, the test is considered invalid and must be repeated. A drop of the sample (whole blood, serum, or plasma) is added to the sample port (S) of the test device. The sample drop reconstitutes the conjugate of gold particles linked to anti-CHW antibodies (Ab) dried on a pad in the test device. A chase buffer is often used to improve flow. The CHW antigen (Ag) in the sample and the reconstituted conjugate flow down the test strip over 2 specific areas. The first area is a line containing anti-CHW Ab (test line, T), which is immobilized on the strip. If CHW Ag is present, the anti-CHW Ab will capture it along with bound particle conjugate, causing a visible line to form. Excess conjugate migrates past this line and over the control (C) area, where conjugate-specific antibodies capture the particle conjugate causing a visible line to form. Positive samples must produce obvious lines in both the test and control sections of the strip for the test to be valid. Negative samples produce an obvious line only in the control section. Invalid tests, indicated by a line in the test area but not the control area, or by no lines in either area, must be repeated. Are not always precise with regard to correlation between the amount of heartworm antigen in the blood and the number of adult female worms. In addition to detection of microfilaria and/or heartworm antigen, other tests may be useful in diagnosing CHW infection, especially in microfilaria-negative dogs or dogs with low worm burdens. Recently, polymerase chain reaction (PCR) technology has been used for the detection and identification of specific microfilaria in peripheral blood samples. Another multiplex PCR assay was used to distinguish between 6 different species of microfilariae in dogs and resolve discrepancies in morphologic diagnosis by 2 diagnostic laboratories.11 Molecular speciation identified microfilaria from several samples as D immitis, differing from an original morphologic diagnosis as Acanthocheilonema (Dipetalonema) reconditum. Currently, the clinical relevance of PCR testing for CHW is low because it is not available through large commercial laboratories. Figure 3. 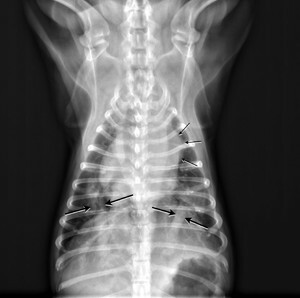 Ventrodorsal thoracic radiograph from a 6-year-old neutered male pug that was presented for labored breathing. The patient spent the last 3 years in Louisiana and had not been receiving heartworm preventive. The ventrodorsal thoracic radiograph revealed blunted, enlarged, and tortuous pulmonary arteries (large arrows) and an enlarged pulmonary trunk (small arrows). 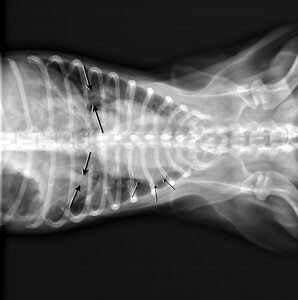 These radiographic findings are consistent with heartworm disease. Figure 4. B-mode echocardiogram obtained in the left parasternal approach during diastole. The right ventricular wall (RVWd), right ventricle (RVd), and interventricular septum (IVSd) are identified. The heartworms (arrow) are identified in the right atrium (RAd). Given that in-clinic antigen assays are now the primary method for detecting CHW infection in dogs, it is important to know how well current tests are performing. In the past 10 years, some tests have been reformulated and new tests have been introduced. We evaluated the performance of 4 immunoassays currently available for point-of-care diagnosis of CHW infection. Samples from a total of 114 dogs were tested, including 51 negative and 10 positive ethylenediaminetetraacetic acid (EDTA) whole blood samples, and 15 negative and 37 positive serum or plasma samples (Table 1). * Samples were collected from dogs participating in CHW screening or outpatient clinics at the College of Veterinary Medicine, Western University of Health Sciences. These animals were pets of veterinary faculty, staff, and students living in an area of Southern California with low prevalence of CHW infection. 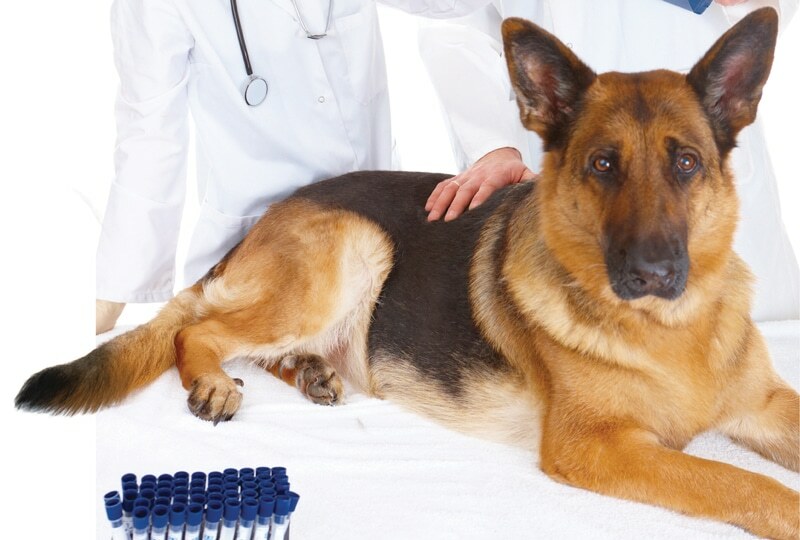 Most dogs (38/51 whole blood samples), including all dogs with history of living or travelling outside of California, were on a monthly CHW preventive program. ** Samples were obtained from a commercial laboratory. These samples were collected from dogs that had been experimentally infected by IV transplantation with adult heartworms 4.5 to 12 months before sampling or inoculation of L3 larvae 1 to 3 years before sampling. Uninfected control dogs were also sampled. Tests were designated A, B, C, or D. Concordance among the tests was excellent. The only discordant test was a weak positive on Test A that was negative on all other tests. The sample, which was whole blood from a healthy, low-risk dog, was rerun on all tests with the same results using both whole blood and plasma. None of the 114 samples run on Tests A, C, and D were invalid; 2 samples run on Test B did not develop a positive control line and were declared invalid. The same samples were repeated successfully on additional Test B units. The ability of the CHW tests to correctly identify CHW diseased dogs (sensitivity) and CHW disease-free dogs (specificity) was determined using the described criteria for identification of diseased and nondiseased samples (Table 2). Tests B, C, and D each demonstrated 100% sensitivity and 100% specificity, while Test A demonstrated 100% sensitivity and 98.5% specificity. All assays were run and scored by a single evaluator (Barr) according to the manufacturer’s directions for use. The evaluator was blinded to status of serum and plasma samples, but only partially blinded to status of whole blood samples due to awareness that most of these samples came from a low-risk population. Some potential for bias existed in the performance of diagnostic tests in this study. CHW infected animals were all artificially infected. Of these 47 dogs, we received information on the infection dose for 25 dogs, with necropsy data available on 6 dogs. The worm burdens in the artificially infected dogs were similar to the mean number of worms reported for naturally infected dogs in Michigan, higher than those reported for Maine, and lower than those reported for Florida.8,15 However, marginally infected animals (worm burden of < 2 adult females), which can represent the largest numbers of false negative animals, were underrepresented and, therefore, our reported sensitivity values may be artificially elevated. On the other hand, reported specificity values may be artificially elevated due to incorporation bias within the CHW negative group (see Standards for Heartworm Testing).14 The accepted gold standard is absence of adult worms at necropsy, but our disease-free population was defined by alternative criteria that included previous negative CHW antigen test results. This can lead to significant bias and artificial elevation of test specificity. The accepted gold standard for CHW testing is presence or absence of adult worms in the pulmonary arteries and/or heart on necropsy examination.7-9 However, necropsy as a gold standard for diagnostic assays presents difficult procedural and ethical challenges. Therefore, our evaluation of positive samples for gold standard status was based on partial verification. We included a limited number of necropsy-confirmed samples obtained from a laboratory involved in CHW research. In addition, we included blood from dogs that were experimentally infected with CHW. Samples from healthy dogs that were highly likely to be CHW-negative due to geographic location and previous negative CHW antigen test results and/or history of preventive medication were considered to be negative for the purposes of this study (Table 2). Previous negative test results (multiple times in some dogs). However, because the previous negative test results were determined by 1 of the 4 test kits (Test D) utilized in this study, the potential for bias, although small, is still present. In most cases, diagnosis of CHW infection is relatively straightforward and easily accomplished through in-clinic testing. However, an understanding of the heartworm life cycle and recognition of the limitations of current diagnostic procedures are critical to successful diagnosis. Decreased sensitivity of detection when very few or no female worms are present. Commercial CHW antigen tests have high sensitivity and specificity but performance may be compromised when these limitations are encountered. We gratefully acknowledge veterinary technicians Kathryn Gresco, Eva Jaeger, and Kimberly Holt for their help with the CHW screening clinic. We also thank Dr. Brenda Knowlton and student representative Bridget Morton of Pfizer Animal Health for helping plan and organize the clinic. Partial funding for this study was provided by SafePath Laboratories (safepath.com). Bowman D, Little SE, Lorentzen L, et al. Prevalence and geographic distribution of Dirofilaria immitis, Borrelia burgdorferi, Ehrlichia canis, and Anaplasma phagocytophilum in dogs in the United States: Results of a national clinic-based serologic survey. Vet Parasitol 2009; 160(1-2):138-148. Bowman DD, Atkins CE. Heartworm biology, treatment, and control. Vet Clin North Am Small Anim Pract 2009; 39:1127-1158. Lee ACY, Montgomery SP, Theis JH, et al. Public health issues concerning the widespread distribution of canine heartworm disease. Trends Parasitol 2010; 26(4):168-173. American Heartworm Society. 2005 guidelines for the diagnosis, prevention and management of heartworm (Dirofilaria immitis) infection in dogs. Vet Parasitol 2005; 133:255-266 (revised January 2010). Revised guidelines available at: heartwormsociety.org/veterinary-resources/canine-guidelines.html. Bourguinat C, Keller K, Blagburn B, et al. Correlation between loss of efficacy of macrocyclic lactone heartworm anthelmintics and P-glycoprotein genotype. Vet Parasitol 2011; 176:374-381. Courtney CH, Zeng Q-Y. Relationship between microfilaria count and sensitivity for the direct smear for diagnosis of canine dirofilariosis. Vet Parasitol 2001; 94:199-204. Weill GJ. Dirofilaria immitis: Identification and partial characterization of parasite antigens in the serum of infected dogs. Exp Parasitol 1987; 64:244-251. Courtney CH, Zeng Q-Y. Comparison of heartworm antigen test kit performance in dogs having low heartworm burdens. Vet Parasitol 2001; 96:317-322. Atkins CE. Comparison of results of 3 commercial heartworm antigen test kits in dogs with low heartworm burdens. JAVMA 2003; 222(9):1221-1223. Gioia G, Lecova L, Genchi M, et al. Highly sensitive multiplex PCR for simultaneous detection and discrimination of Dirofilaria immitis and Dirofilaria repens in canine peripheral blood. Vet Parasitol 2010; 172:160-163. Rishniw M, Barr SC, Simpson KW, et al. Discrimination between six species of canine microfilariae by a single polymerase chain reaction. Vet Parasitol 2006; 135:303-314. Bahr RJ. Heart and pulmonary vessels. In Thrall DE (ed): Textbook of Veterinary Diagnostic Radiology, 5th ed. St. Louis: Elsevier, 2007, pp 583-584. Atkins C. Canine heartworm disease. In Ettinger SJ, Feldman EC (eds): Textbook of Veterinary Internal Medicine, 6th ed. St. Louis: Elsevier, 2005, pp 1124-1125. Mower WR. Evaluating bias and variability in diagnostic test reports. Ann Emerg Med 1999; 33(1):85-91. Kaiser L, Williams JF. 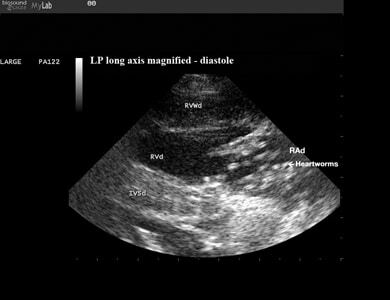 Dirofilaria immitis: Worm burden and pulmonary artery proliferation in dogs from Michigan (United States). Vet Parasitol 2004; 124:125-129. Margaret C. Barr, DVM, PhD, is a professor of virology and immunology and serves as a coleader and facilitator for the Veterinary Basic and Clinical Sciences problem-based learning (PBL) course at the Western University of Health Sciences College of Veterinary Medicine. Dr. Barr is also the project director for the Snow Leopard Functional Genomics Initiative and serves on the board of directors for Pegasus Rising, an organization that provides equine-assisted therapy to veterans. Her interests include translational research on diagnostic assays for infectious diseases, nontraditional methods of immunization, emerging and reemerging infectious diseases, and host immune responses to infectious diseases. Current research projects include investigation of the molecular epidemiology of canine parvovirus and rickettsial agents in southern California. Dr. Barr received her DVM from Auburn University and her PhD from Cornell University. Elizabeth P. Boynton, DVM, is the director of the Hill’s Wellness Center, directs the professional communication curriculum, and facilitates problem-based learning and clinical skills laboratories at Western University of Health Sciences College of Veterinary Medicine. She is a member of the California Veterinary Medical Association’s House of Delegates and House Advisory Committee. Prior to her position at WesternU, Dr. Boynton worked in private practice and then filled a new position as community practice veterinarian at Univeristy of Minnesota Veterinary Teaching Hospital. She was presented with the Faculty Appreciation Award twice as well as the Minnesota Veterinary Medical Association’s Outstanding Faculty Award. She received her DVM from University of Minnesota. Peggy Schmidt, DVM, MS, Diplomate ACVPM, is an associate professor of population health and epidemiology at Western University of Health Sciences College of Veterinary Medicine. Dr. Schmidt serves as director of College Outcomes Assessment and coordinator of the WesternU DVM/MPH dual degree program. Her areas of research interest include evidence-based veterinary medicine, veterinary public health, infectious diseases, and veterinary education. Dr. Schmidt received her DVM from University of Minnesota. After working in a mixed-animal practice in western Minnesota, she joined Iowa State University College of Veterinary Medicine as an instructor while pursuing an MS degree in veterinary preventive medicine. Frank Bossong, DVM, is an assistant professor in shelter medicine at Western University of Health Sciences College of Veterinary Medicine. He is also the head clinician for the Veterinary Ambulatory Community Service (VACS), a second year problem-based learning facilitator, and a course leader for the third-year internal medicine course. Dr. Bossong received his DVM from University of Georgia. After working as an associate for 4 years at an AAHA-accredited hospital in Pasadena, California, Dr. Bossong pursued his interest in shelter medicine. He established an on-site veterinary clinic, medical policies and procedures, and a fourth-year veterinary rotation at the San Gabriel Valley Humane Society, where he currently serves on the board of directors. Gary R. Johnston, DVM, MS, Diplomate ACVR, is a professor of radiology at Western University of Health Sciences College of Veterinary Medicine and teaches all levels of the curriculum, facilitates problem-based learning, and participates in clinical research. Dr. Johnston received his DVM from Washington State University and then completed a rotating small animal medicine internship, MS, and residency in radiology at University of Minnesota. He remained at the University of Minnesota as a radiologist, progressing from assistant professor to full professor. Dr. Johnston spent 3 years at Washington State University College of Veterinary Medicine before joining the WesternU faculty.